Then even the whole HUD can be considered an assist, like ingame telemetry.. I wouldn't disagree. The biggest assist to me will never be considered an assist in forza, chase cam. I wouldn't say all of telemetry is an assist because real world racing does the same thing and even many consumer cars will give you some of that information like fuel tire pressure, tach, speedo, you would feel a car bottoming out which u cant in game even with a wheel so the damper/spring info only tells you that and some cars irl even tell you if u lock up the tires so that info isn't even unrealistic to add. However a track map and even the indicator to tell where another driver should be an assist. even the indicator to tell where another driver should be an assist. I disagree with this one, since spotters exist in real world racing. The position indicators in Forza only take the place of an audio based spotter. Having them as an assist, it could potentially discourage the use of it as a feature because of the whole "assists are bad and slow you down" mentality that seems to get thrown about in racing games. Fair point and I dont disagree with using it. I use something similar in other titles and it's only partially helpful. However with the new system of not tracking race times to leaderboard even those who want hardvore have no reason not to use it except for the purpose of realism. However with the new system of not tracking race times to leaderboard. Your times should still be tracking to a leaderboard, just not the one under rivals. there needs to be a Horsepower slow down when people cut corners and they should lose points for doing so in Race Leagues or any race for that matter! or have there Position taken away at the end of the race. it is kinda of getting really stuiped with all those that are cuting corners and so on. Turn one is still a show of racing's finest moments. Collision penalties will be needed to prevent that in addition to track limit penalties. People may learn to enter turn one in a more orderly fashion.... who am I kidding? I also strongly advocate ghosting of cars being lapped. This last group is typically where the rammers lurk. Even with penalties, people will still be gung- **** in to Turn 1 because there is no tangible risk to the damage (it's just a game, you don't have to pay for repairs). All racing games suffer from this disconnect from reality, even if there is no rewind feature people will still push the limits further in a virtual setting than a real one. I have seen this lately on tracks like Prague and Rio where the track limits on the chicanes are an absolute joke losing you a second or more per lap taking the new clean line. All the new track limit update has done is put clean drivers at more of a disadvantage in a public lobby. This should have came with the penalties instead of being put off for people to learn the new limits which sounds like a bit of a cop out. It will be here when this season of Forza RC is over as I'm sure that's the real reason for delay. Cutters will only follow track limits when penalties cripple there race results. The most exploitative know that 1 clean lap is all that is required for a decent grid slot. Easier achieved out of drafting range. At this point, even if they release the Adjudication/Regulation/Penalty System in September, it’s only going to give a few weeks of access before Horizon 4 emerges. Sure, one might ask “Why can’t it offer more than just racing?”. It certainly can, and it does, but that also changes the clientele. On one side you have the serious racers that want rules that are followed and enforced. On the other side you have drivers that just want to have fun and fool around. Oil and Water. It will be interesting to see where the future of this franchise goes. Sometimes I wrestle with my demons... sometimes, we just snuggle. In 4 words: they ruined Prague's flow. I did some experimenting on that corner after the track limits were first released. You can actually cut this corner slightly, it requires taking an extremely wide entry and rotating the car early. As you need 3 or more wheels over the line to dirty the lap and because this section is so narrow, you can cross this section with only ever having two wheels off at one time. But still it is an awful interpretation of the track limits of the corner. In a race situation this corner will be awful. I agree with the difficulty in VIR Patriot. But this sharp corner was always present at this track. Since FM6 it is rare to see a clean lap on this track. Remember that we can practically pass with the car on this end, protecting only the two wheels outside the curve. For any "city" environment, the limits should be technically defined by the walls. I didn't realize this until I was cruising fast through Spa with the previously ill-defined track for turns 2-4. I've also found some areas where if you still have 2 wheels on the road with the other 2 on the curb, it will still dirty the lap. I'm all for the redraw, but normal track limits still needs to be referenced. So in your mind you should be able to cut the Swimming Pool chicane at Monaco (yes I know it isn't in the game, but it is a real-world street circuit) because the wall is further back? I really don't get the whole "the walls should always be the limit" mindset. The track is the track. Walls are there to act as safety barriers or to limit run-off, yes in most locations they also define the edges of the track but if there are painted lines (not lane markings) or rumble-strips they take precedence for track definition. Whilst you could be a bit more generous with the kerbs at Prague on the old definitions, you could still dirty the lap through there without hitting the walls, all that has changed now is you can take slightly less kerb (I actually think the track limits overlay is making people overly cautious, you can still hammer through the chicane pretty aggressively and stay clean but people just seem paranoid to push the limit now that they can clearly see where it is). Everyone has talked a lot about fair play, how unpleasant it is to have another player hitting you until you lose control of the car. How unpleasant you are to be in front using the stroke and someone tries to pull you out of the stroke. Question: Why are avatars' AIs programmed to do this, even when they are marked not to be aggressive? Should not fair play begin with the avatars of career mode? Can someone from T10 answer? A lot of us actually regularly drive, even instruct, on some of the real world tracks. These types of GROSS ERRORS need to be FIXED - PRIOR to any PENALTY SYSTEM being imposed. Let us enjoy the fantasy of driving the real world tracks as they are actually driven. 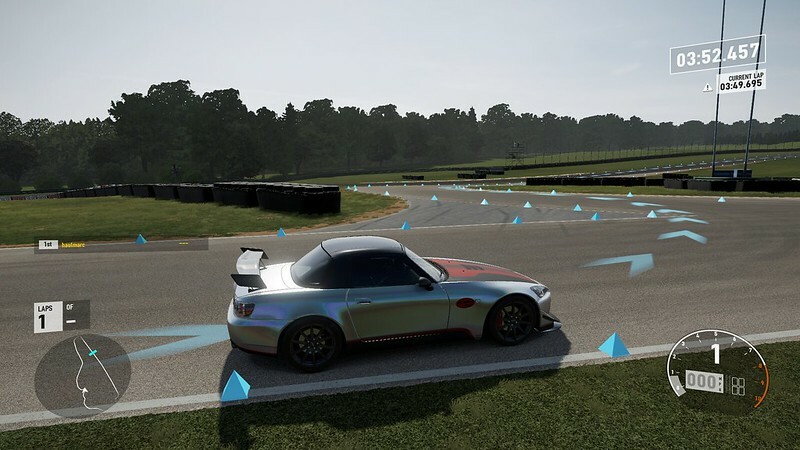 It is not that much to ask that the limit definition coding process include actual race observations at the various venues to eliminate overly restrictive (or overly generous for that matter) track limits in FM7. As for the fantasy tracks - like Prague, Rio and others - changing track limits now and altering/eliminating formerly "clean" lines - after so many hours of play and practice (sometimes through multiple Forza iterations), seeking the "fastest" (formerly) clean line is extremely discouraging to the veteran Forza players and the reason for doing so NOW is curious - at best. I hope they bring rolling starts too so that start line mayhem would be avoided more easily. Now there are people face backwards in less than second from green light. Sorry if this has already been addressed, I can't recall seeing it mentioned - have they explicitly said whether the new Race Regulations system, when it does arrive, will be for multiplayer only, or whether it will be in single player races as well? Per Chris Esaki in today's Forza Monthly livestream, the Race Regulations feature won't be in the September content update tomorrow, but they're still working on it to get it right and will provide announcements before the feature is ready to release.